People come to us because we offer More Integrity & Honesty than the Dealerships. We treat all cars like their our own. If the installation of a new Nissan "Z" car Aftermarket Clutch Kit is let go too long, eventually the vehicle will no longer be able to transmit power to the wheels at all, leaving the vehicle at a total standstill. For fast and helpful information on a Nissan "Z" car Clutch Kit give us a call at: 562 693-9914! Want a company that'll be there for your Nissan "Z" car clutches needs all the time, no matter what? We're just the company you've been searching for. Suspension systems are a classic example of how we end up with certain equipment on our stock vehicles. It's all about compromise. With suspension the compromise is often between ride and performance. Generally, a car that handles corners well with a minimum of body roll is also rough riding. Since the average Nissan Datsun owner would rather be comfortable than take a corner at speed, the suspension is designed to favor ride comfort. The Air Conditioning might not seem as important to the productivity of your Nissan "Z" car as something like the engine or transmission. However, the Air Conditioning is just as vital to your Nissan's car productivity. Without proper working Air Conditioning, you will not be able to get the full Nissan "Z" car driving effect. We have Nissan "Z" cars used Transmission that will fit your budget. If you don't know what year your Nissan "Z" car vehicle is, check the interior door panel on the drivers side, and you will see the year along with other OE information. This is the best source for finding out what year your Nissan "Z" car is. Ordering your OEM replacement or your used Transmission is easy. First you will need to know the year, and we just told you how to find the year of your vehicle if you don't already know, but you also need to know the specification of the Transmission such as left, right, front, rear, engines size, etc.. To search the left or right, sitting in the Nissan vehicle you are in the drivers or in the passenger seat. The drivers seat is the left Transmission and the passenger side is the right Transmission. Made From Select Non-Asbestos Organic Formulation Using Aramid Fibers Without Steel Fibers Or Carbon Particles Which Produce Dust, Designed To Minimize Brake Dust Up To 40% Better Than Standard Pads, Engineered To Resist Fade And Reduce Noise Under Extreme And Normal Braking, Designed For Spirited Street Driving, Offers Better Brake Effect Up To 600 Degrees Celsius (1100 Degrees Fahrenheit), Features Brake-In Coating For Super Quick Pad Bed-In And Center Line Slots To Prevent Heat Expansion Cracks, Set Includes Left And Right Brake Pads, Recommended For Cars With Up To 200 Brake Horsepower". We can overhaul your engine with quality new and used nissan parts. We have the expertise to do the job right the first time. We have many quality parts on hand here at the shop. We have the resources to get the parts you need in a timely matter. 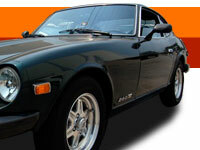 Nobody can beat our expertise when it comes to the electrical systems on Nissan Datsun Z's. A turbo charged model (using the L28ET engine rated at 180 bhp (134 kW)) was introduced in 1981, and was available only with a 3-speed automatic transmission. At the time of release, the Nissan "Z" car Turbo was the fastest Japanese import in the American market and was the fastest production car money could buy, apart from two exotics (the Porsche 911 SC and 928). Call us today if you need help repairing your Nissan Datsun. 1970-1983 Body Parts, Seats, Engines, Rear Ends, Windows, Wheels, Etc.